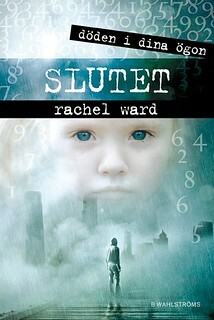 Admittedly, on the cover of my copy it says Döden i dina ögon – Slutet, but it is the same book by Rachel Ward. She has diligently supplied me with all three Numbers in Swedish, and I have now reached the end. That’s what the translated title means, which is a little more final than infinity. So it was my usual mantra of me thinking ‘this is a book for young readers, it surely can’t end totally badly.’ And despite its dystopian nature, there were a few characters still around on the last page. Adam keeps seeing people’s death dates in their eyes, and he hates it. But after little Mia apparently escaped her date and switched to someone else’s, he doesn’t know what to think. Sarah still dreams true dreams, whereas Mia sees everything in colours. They are living in a camp with other survivors after the great catastrophe two years earlier, and Adam is sick and tired of being recognised as ‘the one’ and he is also worried in case the authorities will catch up with them. Someone does turn up, and it seems it might be Mia’s ability to switch that is of most interest to them. As ever, very exciting, and not for the fainthearted. My apologies for upsetting the trains again. Last month as I was gallivanting about in Fife and places, I caused it to snow, and this time round there appears to have been floods in one or two areas. I never intended any of this. Really sorry! Anyway, there I was, carting a Christmas tree round St Andrews, getting a little tired from having my hands quite so full. 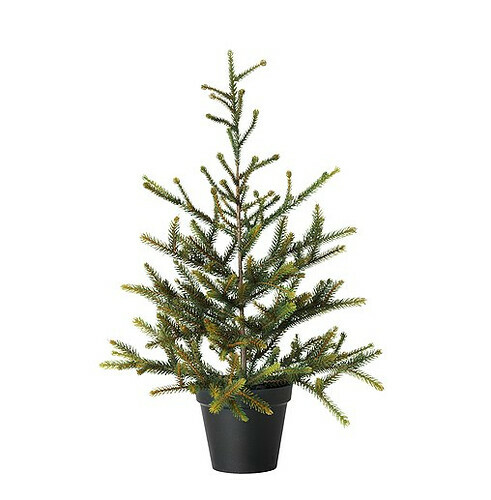 The tree and I went into a bar and sat down, waiting for its rightful new adoptive mother. Eventually she arrived, and we ate pizza while watching staff lay the tables for a wet Christmas ‘dinner’ later in the evening. Seems it’s a trick they pull on new students. It wasn’t just trees I delivered. I brought Daughter her very own copy of Code Name Verity, because she’s currently into war books, and there IS NO WAY I will let her have my copy. For my own needs I had four books, which I calculated ought to see me through the day. Finished two and read a little poetry from the third, leaving the fourth to another day. By the time I had passed Perth for the second time I felt I needed to stay awake and alert enough not to go to Glasgow by mistake. That’s for today, that is. Glasgow, but not as a mistake. On the right day it’s a delightful place to walk through. You walk out of Queen Street station, turn right, and when you get to the church you turn left, and then right by the Tardis, and walk until you’re at Central station. They saw me coming. 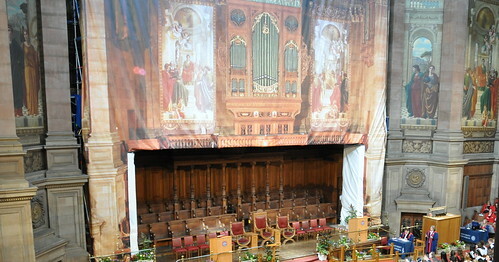 The scaffolding was up in the McEwan Hall, although it was hard to spot with their clever hiding of the fact. Even Son’s tutor, who sat right underneath it, failed to see how perilous his position was. It was time for the long awaited Masters graduation ceremony on Tuesday morning. All of us had tickets this time, and the Resident IT Consultant only missed the turning once on the way there, and we did get to see the new – and rather idle – trams as we whizzed past. Also happened to notice there are such things as Panda packages. I am guessing it’s a hotel package which somehow involves meeting the famous pandas. These days they hand out Honorary Doctorships to failed (i.e. never-quite-made-it) lavatory attendants. That is a Good Thing. 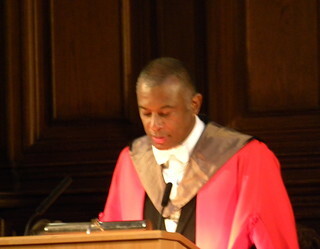 Just think; if Caryl Phillips had not been turned down by the Princes Street public toilets, he might never have written all those things he has written, or taught in all those fancy universities, or got his Honorary Degree of Doctor of Letters from Edinburgh. I imagine the toilet people felt he was over-qualified. Oxford degrees can have this effect on people. 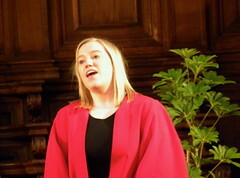 OK, back to eldest Offspring. It was his day, really, and his turn to be bashed on the head with that funny hat, which by some miracle is now not orbiting Earth, but instead has a piece of velvet which has travelled in space sewn inside it. 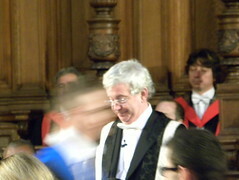 If the Vice-Chancellor’s tale is to be believed. Nice ceremony, with the right amount of speeches – i.e. not too many – and musical interludes of a tolerable kind. And did you know you can even get an MSc in Creative Writing? Perhaps I had better look out for these students in the book world in the future. Then it was on to drinks next door, with Son boldly smuggling us all in. I was introduced to Danish tutor Bjarne Thomsen who has an interest in children’s books, and also emeritus Dr Helena Forsås-Scott, who told me about various recent events to do with Swedish/Scandinavian children’s books. We discovered we had attended the same university which, judging by her accent, didn’t surprise me. We repaired to a nearby Italian restaurant for (what wasn’t) a Goat Wellington, and some other nice food. Once outside again, we were waiting for the Resident IT Consultant to bring the car round, when we were chatted up by a silver-shoed Norwegian man, who had no idea that the new translator he suggested would need a working knowledge of Norwegian, actually had precisely that. We giggled and fled into the car when it turned up. It’s hard work, this academic stuff. Even for the lazy by-stander. I already had two authors, plus one Son, on the go for Monday, when a third one said she wouldn’t mind meeting up. But that was not to be. The afternoon could only be stretched so much, and I was already overstretched. 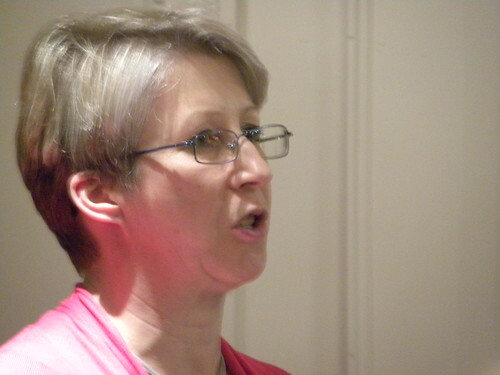 First on the agenda was lunch with yet another Perthshire author. 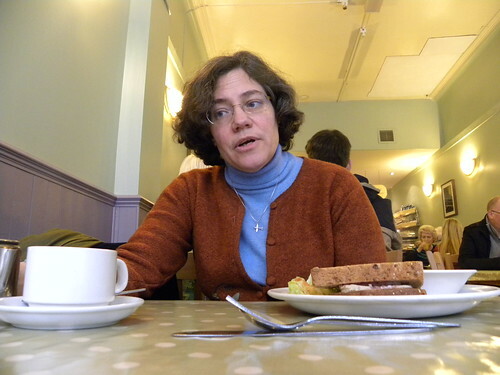 Elizabeth Wein left an incinerator meeting in Perth in order to eat a corned beef sandwich with me in Stirling, telling me all about her most marvellous book Code Name Verity, and showing me pilots’ stuff from the war and secret silk maps and everything. And I learned that Maddie lived just round the corner from me. It’s as if it was meant. We had a nice, if noisy, lunch in a traditional café (because of the war) and we talked, talked, talked. Elizabeth admitted to an interest in vintage underwear. Just so you know. After lunch I had to hop on the train to Edinburgh, for some freshly baked cookies at Son’s and Dodo’s. The Lapsang Souchong was so smokey it set the smoke detector off. Or it might have been the cookies in the oven. Grabbing my M&S sandwiches (sorry, I seem to talk a lot about food) I got on the 49 bus to the Royal Terrace Hotel, where Nicola Morgan was going to talk about brains. I had been looking forward to sitting in the bar with Nicola and the other two people there, but contrary to Nicola’s modest expectations, her event sold out and I had to share her with loads of other people who also wanted to learn about the teenage brain. Pardon, the adolescent brain. There is an explanation as to why teenagers appear to be unable to be more articulate than to say ‘uhh’ at all times. Even old Shakespeare noticed this. I will return with more details on the prefrontal cortex front later this week. Just now I will leave you with a brief mention of the dainty little cakes Nicola had on offer afterwards. Some of us drank tea and ate cake (oops, eating again) while others bought books. It was a nice walk back to Waverley, passing a pretty old church at the end of the cobbled street, and with a lit up path meandering up Calton Hill. If I’d known what I was doing, and if I had not had a train to catch, I might have investigated some more. As it was, this turned out to be my second foray into unknown book related territory at night in one week. After years of me bringing Offspring along to interviews, and then borrowing other people’s children for the same purpose, I have finally got to the point where the interviewee arrives with children in tow. (They were invited!) The circle is complete, and all that. And whereas I have used (my own) children’s labour to obtain photographs in the past, very little has changed. 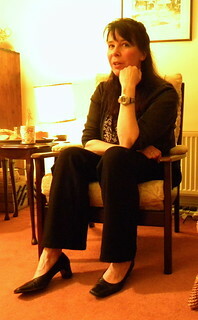 This time I borrowed the visiting Miss Grant to take pictures of Mum, aka Helen Grant. While Master Grant made the most of the Grandmotherly wifi and charged his laptop, his sister took photos and read books, as befits the true child of an author. The mothers ate cake. Obviously. Pizza. Garlic bread. I won’t tell you how many slices Helen ate. Tea and glasses of Coke were also consumed during the process of interviewing one of Scotland’s more recently imported authors. Helen’s new book Silent Saturday won’t be out until next year, but we need to think and talk about it before then, which is why three quarters of the Grant family kindly got themselves lost while searching for the Grandmother’s abode. The fourth quarter Grant avoided this by rescuing some mountains instead. So, Helen and I discussed Flanders and Belgium, where the book is set, and we talked languages, because that’s important in the book. We talked background and all sorts of others stuff, and you will have to wait for all this because – as I said – the book won’t be available just yet. Helen had to restrain herself from giving away too many spoilers as regards books two and three, and since not one of you (?) has even read the first one yet, I can’t say much about that either. After this we talked about all sorts of other things while enjoying the Resident IT Consultant’s heating-up-food abilities. Picts. Flemish lessons. Lost railway lines. You know. At last a book I am still too young for! It’s ’60 and up’ and I’m not there yet. Hah. 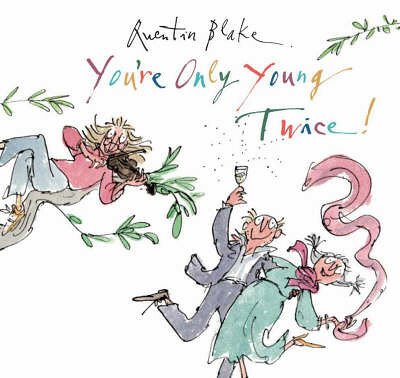 Quentin Blake, however, is very surprisingly 80 this year, and his book is here to celebrate that fact. Some years ago Quentin was invited to come and paint pictures on someone’s hospital walls, in the ‘elderly wing’ and now those pictures have become a book as well. I would almost want to go and live in that hospital wing, or let’s say that if and when I do need to be carted off, that’s the kind of wing I’d be after. Every page, and one assumes, every wall, is full of happy wrinklies, doing fun things. Peeling apples, juggling fruit, sitting on tree branches. In fact, they are doing quite normal things like arm wrestling and playing football and reading books. So that looks hopeful enough, for when the time comes. You’re Only Young Twice! is fabulous. It shows us that old people are normal people, doing what we should all do if we could; enjoying life. Best done now, if at all possible. In case some of us don’t qualify for the recommended reading age. Chekhov, Tjechov, Tschechow, Tšehov, Chéjov or Tsjekhov? Yes, you tell me. They are obviously all the same man. I grew up with the second version and am doing my utmost to spell him in English these days. It’s not easy. I generally have to look it up every time. And here you can see how carried away I got with Wikipedia. The other ones are German, Finnish, Spanish and Norwegian, to save you having to Wiki them as well. The interesting thing is that if we all stand around saying the name out loud, there won’t be much difference between any of them. Same with Alexander Solzjenitsyn, Solzhenitsyn or Solschenizyn. Can you even tell which languages these are? So similar. Despite taking it for granted – I mean, I do now. 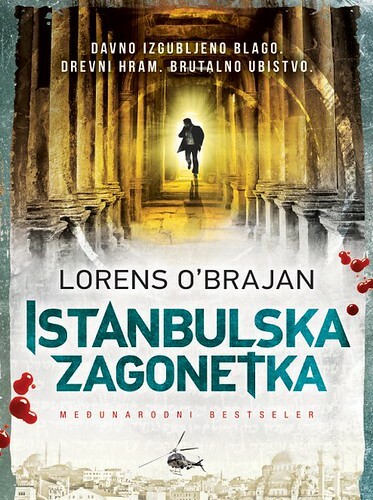 I used to think it was downright weird to have a version for every language – that we need to spell differently in order to say the same thing, I was taken aback when Laurence O’Bryan was taken aback by his Serbian crime novel cover. He’d turned into good old Lorens O’Brajan. I don’t speak Serbian, but can tell it’s a bestseller, probably features Istanbul, and it’s brutal. Funny how we freely borrow certain words and phrases, either exactly the same or very similar, while still translating proper names. It’s a fantastic cover, though, don’t you think? I reckon I’d be happy to be O’Brajan for a cover like that. Brutal bestseler and everything. (Better than poor Vilijam Rajan.) In fact, I’m so keen to read it I am getting annoyed at my lack of linguistic skills. Mary Hoffman apparently has a Chinese translation of her first Stravaganza book out now, but she can’t tell what her name might be, or anything else much. Luciano even has red hair. Not necessarily in the book, but on the cover. Hopefully a Chinese book means millions of sales..?